Exciting! Number 6 and 7 on my list of the 96 highpoints of the French departments. Catherine and I had gone to Paris to stay with the in-laws because Catherine was scheduled for a seminar in Paris one day and in Toulouse the following day, and I had just come along to watch the kids (barely 4 months). Luckily, however, the parents-in-law were gladly volunteering to take up that duty and I got away for a couple of hours. I had researched these two hills (let's not call them peaks) on topo maps and found out that Bois de Verrières was the high point of department no 91, Essonne, and Vaucresson, which is really just a city on a small elevation was the high point of department no 92, Hauts-de-Seine. Both were located to the southwest of Paris and about a 30 minutes drive from where I was staying. 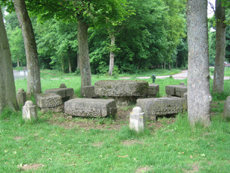 I first drove to the Bois de Verrières and parked near the edge of the forest. From the topo map I had printed on Google, I could see that the high point would be the center of the wooded area and that numerous roads (or hiking trails) were leading to it from all directions, thus creating a starlike image on the map. At first I had trouble locating myself on the map, but after a few minutes of cross-country hiking and following faint mountainbike trails, I reached a larger forest road and asked a hiking couple about the direction to the highpoint. They were not completely sure, but referred me to an intersection not too far away, where with the use of street signs I was able to pinpoint myself on the map. Then it was just a leisurely 1km hike to the high point, reaching an amazing 172 meters after probably gaining 40 or so from where I had parked. I took a few pictures, before returning to the car a different way. Not very exciting, but still a nice hike in a beautiful forest in an otherwise densely populated area. The second highpoint of the day was rather anticlimatic as I reached it after driving to the town of Vaucresson, where I just drove the streets until I got to what I (and the topo map) thought to be the highest point. With 192 meters it was higher than the previous hill, but clearly less defined as the obvious highpoint, as it was located in a residential neighborhood. I parked the car and walked up and down the street for a few minutes without being able to say if the true high point was in the center of street or in a nearby garden (behind a fence). I took a picture just to proove that "I had been there" and left. It will be good to get these lower elevation high points out of the way before concentrating the higher ones.